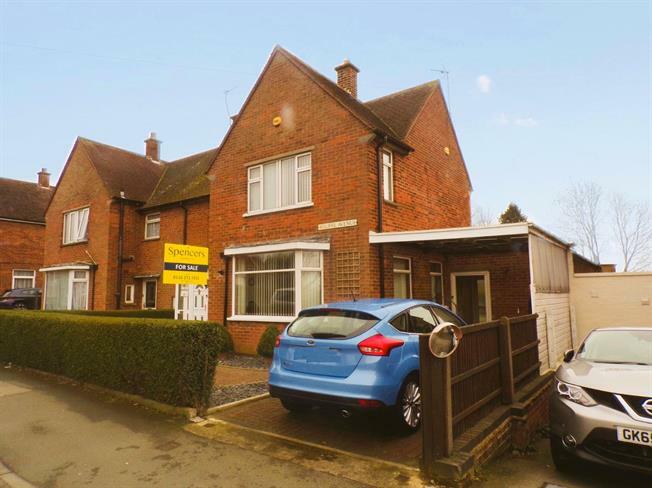 3 Bedroom Semi Detached House For Sale in Leicester for Offers in excess of £240,000. This three bedroom semi-detached property is located within close proximity to both the parade and Langmoor school. Accomodation comprises lounge, seperate dining room, kitchen, utility, and conservatory downstairs. Three bedrooms and bathroom of landing upstairs. Externally is a driveway for off road parking benefiting from a car port and to the rear is a great sized garden with an out building housing a workshop. Carpeted flooring and ceiling lights, stairs leading to landing and doors leading to lounge and dining room. Carpeted flooring and ceiling lights, radiator heated and sliding doors to the conservatory. Radiator heating. Carpeted flooring and ceiling lights, Double glazed bay window facing the front aspect. Radiator heating. Fitted wall and base units with worktop, space for oven and integrated over hob extractor. Double glazed window to the rear aspect. Door leading to utility area. Radiator heating. Power and space for appliances. Self contained store room. Door leading to the rear garden. Windowed conservaory facing the rear aspect over looking the garden with French doors leading to the garden. Radiator heating. Carpeted flooring and ceiling lights, double glazed window facing the rear aspect, fitted wardrobes. Radiator heating. Carpeted flooring, ceiling lights, fitted wardrobes, double glazed window facing the rear aspect overlooking the garden. Radiator Heating. Carpeted flooring and ceiling light, double glazed windows facing the front and side aspect. Radiator heating. Fitted shower unit, low level WC and wash hand basin. Frosted double glazed window facing the front aspect. Larger than average private landscaped garden. Mainly lawn with plant and shrub borders. Good sized workshop. Paved driveway for off road parking and a car port.